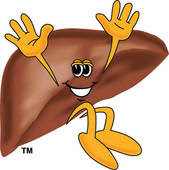 Did you know that your liver has 500 jobs!!!!!! Well your liver is the biggest organ in your body.It lives on your right hand side of your body.It also warms your blood and it sorts out all the food in your body and stalls all the vitamins and minerals and the fat that you need.The liver and the gallbladder work together so they can ooze out the bile.One more fact ,your liver is also the size of a small melon. Keep Your Eye On The Ball!!!!!! !